This newsletter is devoted entirely to recent, little-known chamber music releases. It will introduce you to the cream of the crop, beginning with some works by Czech composer Petr Eben (1929-2007). A wunderkind, young Petr would spend his youth in Ceský Krumlov, Moravia, some 100 miles south of Prague, where he'd become a choir director and organist at the tender age of ten. However, the Nazi occupation of that area during World War II (1939-1945), and his Jewish heritage soon led to dire circumstances. Moreover, at fifteen he was taken out of school, forced to do hard labor, and then sent to the infamous concentration camp at Buchenwald. Somehow, he managed to survive those awful times, and after his release by Allied Forces in 1945, entered the Academy of Performing Arts in Prague, where he studied piano and composition. Following his graduation in 1954, he accepted important local teaching positions until 1977, when he spent a year in Manchester, England as a professor of composition at the Royal Northern College of Music. After that he resumed his academic career at the Academy in Prague. However, the 1968 Soviet takeover of what was then Czechoslovakia, along with his refusal to join the "Party" kept him from any advancement. However, all that changed with the return of a free government in 1989. He then received several long overdue awards, and went on to hold important academic appointments in Prague, where he spent the rest of his life. Eben was composing all this time, and would leave a substantial body of works. Many are for organ, while the remainder cover all other genres, including chamber music. Three of his finest in the latter category fill out this new Supraphon release. The program begins with his string quartet of 1981, which was commissioned by the famed Smetana Quartet (1945-1989). It's subtitled "The Labyrinth of the World and Paradise of the Heart" after Czech philosopher-theologian John Amos Comenius (1592-1670, see 23 January 2015) eponymous book (1623) In four movements, the outer ones depict "The Labyrinth of the World", while the inner reflect "Paradise of the Heart". An "Impetuoso" ("Impetuous") [T-1] opening has busy buzzing, virtuosic passages somewhat reminiscent of those "machine-like" moments in the Mellits' quartets we told you about last time (see 30 September 2017). These alternate with seesawing, pensive ones, and are meant to reflect a chaotic humankind. Then a gently swaying "Andante" [T-2] with a lullaby-like theme [00:14] seemingly represents a peaceful world, while "Con vigore - Moderato Assai" ("With Vigor - Very Moderate") [T-3] may characterize an inquiring state of mind. This becomes increasingly troubled, and subsides into a mysterious, closing song of resignation [05:43]. A final "Drammatico" ("Dramatic") [T-4] begins with passages invoking the mood of the first movement. These become disarrayed, and then subside into a searching episode [02:22] with a questioning violin. The other instruments make a desperate attempt to find a satisfactory answer, but to no avail, and the quartet ends like it began. Next, we get his piano trio of 1986, written while a close family member was seriously ill. According to Eben, it was difficult to compose, and reflects the depressing circumstances surrounding its creation. We're also told it's written so as to contrast the sound of the strings against that of the piano. In four movements, the first marked "Drammatico. Con affetto" ("Dramatic. Lovingly") [T-5] is a bizarre offering. Here rhythmically arresting, aleatoric piano passages that could be interpreted as the specter of Death, are interspersed with insistent strings, which might signify the will to live. They vie for predominance, but in the end the music ends indecisively. A distracted piano and queasy strings characterize the "Andante con espressione" [T-6], which would seem to represent the anxiety Eben must have felt while writing this. Then we get a strange offering titled "Lento - Lesto. Marcia funebre - Valse" ("Slow - Fast. Funeral March - Waltz") [T-7]. Here the piano intones a funeral march ostinato that’s overlaid with a fluttering waltz for the strings. In the context of this work, it suggests a struggle for life. The final "Agitato" [T-8] with its jagged, shifting tempos, buzzing strings, and folkish melodies, brings Bohuslav Martinu's (1890-1959) music to mind (see 31 July 2016). It ends the trio in what seems like a fight for life wrapped around melancholy memories of bygone days [01:28-02:33]. This release closes with a piano quintet Eben wrote in 1992 for the Nash Ensemble of London. Falling into four movements, the opening one marked "Allegro risoluto" ("Fast and Tenacious") [T-9] begins with forte piano chords. Then squealing violins introduce a quizzical eight-note motif (QE) [00:01]. QE is the subject of a developmental quarrel [00:15] that ebbs into a subdued oneiric segment [02:00]. This becomes increasingly animated as the bickering resumes, and ends with impellent piano passages. These give way to a subdued reminder of QE in the strings [05:31], which concludes the movement ambivalently. A somewhat scherzoesque "Allegretto" ("Somewhat Joyful") [T-10] features pizzicato strings to the exclusion of the piano except for an occasional note plucked on its strings. Then as if to protest its absence, the piano officiously introduces a "Moderato" [T-11]. The longest movement here, it's a captivating, QE-related serenade for strings set to a supportive keyboard accompaniment. Here mystical passages build into a dramatic episode [01:58]. This is followed by cheery afterthoughts [04:37], and then [06:43] the music closes much like it began. A furtive piano with only a hint of strings starts the final "Allegretto - Allegro" ("Cheerful - Fast") [T-12]. Subsequently there are flighty keyboard passages, and the strings gradually reenter as the music turns into a frantic rondo built around a QE reminiscent, recurring theme [02:33]. This ends the quintet excitedly with an arresting, last-minute change of key. Members of the Martinu Quartet, joined by pianist Karel Kosárek for the two closing selections, give commanding performances of the rarely heard works on this disc. All technically accomplished musicians, they bring out all the subtle rhythmic and structural details of these intricate scores. The recordings were made between October 2016 and April 2017 in Prague. 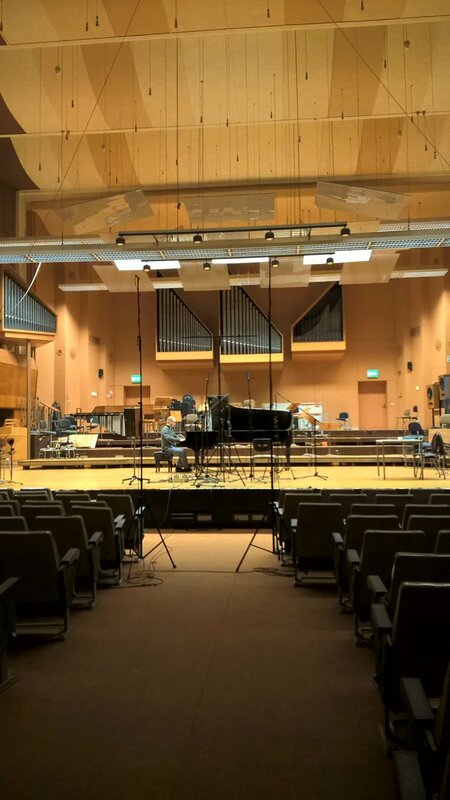 The quartet was done at the Domovina Studio, and is a bit drier sounding than the trio and quintet, which transpired in the nurturing acoustics of Martinu Hall. Otherwise, they present consistently wide, somewhat retiring sonic images with the players well placed and balanced. As for the instrumental tone, the strings are convincing, but a bit edgy. On the other hand, the piano comes across with a pleasant percussive, bell-like quality. In summary, while the sound is good, it falls just short of audiophile. CLOFO is Fuchs country! Distinguished Austrian pedagogue and composer Robert Fuchs (1847-1927) that is, whose pieces have frequented these pages. Moreover, we've told you about some of his orchestral (see 18 April 2011 & 25 April 20 2012) as well as chamber ones (see 26 October 2011 & 31 July 2015). Now this new TYXArt release gives us Robert's complete works for cello and piano. These the only readily available recordings of them currently available on disc. While his music is out of Brahms (1833-1897), who was a close friend, and Dvorák (1841-1904), it portends that of his many students, who read like a Who's Who of late romantic composers. They included such greats as Gustav Mahler (1860-1911), Richard Strauss (1864-1949), Jean Sibelius (1865-1957), Alexander Zemlinsky (1871-1942) Franz Schmidt (1874-1939, see 30 September 2015), Franz Schreker (1878-1934), Max Steiner (1888-1971, see 18 April 2011), and Erich Wolfgang Korngold (1897-1957, see 31 March 2011), to name a few. The program starts with Fuchs' second cello sonata of 1907, which is a genteel work, harkening back to Brahms. In three movements, the opening sonata form allegro [T-1] begins with a lovely, songlike idea [00:01]. This becomes troubled, and is followed by a folksy, tintinnabular tune [01:44]. Then there's a consummate development [02:54], and fulfilling recap [04:51], which brings the music to a tranquil conclusion. Next up, a pensive, ternary form adagio [T-2] with outer sections based on a pleading subject worthy of Brahms. They surround an agitated central episode [01:51-03:57], and end the movement like it started. But the mood brightens with the final allegro [T-3], which is a delightful romp with several engaging folkish ditties. It closes the sonata in jolly fashion. The concert continues with Sieben Phantasiestücke (7 Fantasy Pieces). This is a delightful cycle of sketches with different mood markings, whose underlying meanings are left to the listener's imagination. The first "Etwas bewegt, launig" ("Somewhat moving, humorous") [T-4] seems to express apprehensive feelings wrapped around droll ones. On the other hand, "Ruhig und ausserst zart" ("Tranquil and very delicate") [T-5] is a subdued ländler-like creation, which may bring a restful alpine setting to mind. It's offset by "Lebhaft" ("Cheerful") [T-6], where there's an interplay of quirky and introspective thoughts that recall Joachim Raff's (1822-1882) music (see 30 March 2015). Then "Ruhig und gesangvoll" ("Tranquil and songful") [T-7], which features a lyrically endearing Fuchs' melody, is as advertised. There's something aristocratic about the minuet-like "Anmutig bewegt" ("Gracefully moving") [T-8], while the last two fantasies titled "Etwas langsam, sehr innig" ("Somewhat slow, very heartfelt") [T-9] and "Lebhaft bewegt" ("Cheerfully moving") [T-10], are respectively sentimental and whimsical. The latter ends this charming cycle in cocky fashion with a pronounced "So there!" Filling out the disc, there's the four-movement, first cello sonata that probably dates from the late 1870s. This work found great favor with Brahms, and is dedicated to one of the foremost cellists of the romantic period, Czech-born David Popper (1843-1913, see 31 October 2009). It begins with a sonata-rondo marked "molto moderato" [T-11], whose opening statement (OS) starts with a sad pleading theme (SP) [00:00]. SP is the main recurring idea, and soon succeeded by a chortling countersubject [01:08]. Then SP undergoes an exploration, where it appears as a beaming variant of itself (BV) [01:23 & 02:37], and OS is repeated [03:10]. This gives rise to an imploring development [06:19], in which SP makes a couple of forceful appearances [beginning at 06:49]. Subsequently there's a recap [08:26], and a joyful BV [10:42] introduces an SP-spiked coda that ends the movement somberly. The mood then brightens with a mischievous scherzo [T-12] where a couple of cheeky tunes are tossed about. It couldn't be more different from the anguished adagio [T-13], which features a pining cello, and bridges right into the final allegro [T-14]. According to the interesting album notes, this movement has in the past been associated with the scenic, forested mountain region of southeast Austria known as Styria. Apparently, the composer spent his childhood there, and going on that premise, this seems a happy remembrance of those days. It abounds with catchy folkish ditties, and closes the sonata in jolly fashion. German-born cellist Martin Ostertag gives technically accomplished, sensitive readings of this rarely heard music. He's accompanied by fellow countryman Oliver Triendl, who's appeared in these pages before (see 30 April 2015), and again proves himself one of today's leading pianists. Fuch's cause couldn't be better served! A coproduction with Südwestrundfunk (SWR, "Southwest Broadcasting"), Germany, the recordings were made in 2004 at SWR's Hans Rosbaud Studio in Baden-Baden. They project a generous sized sonic image in a suitably reverberant, enriching acoustic. Both instruments are beautifully captured and balanced against one another. Romantic chamber music enthusiasts won't want to be without this demonstration quality release. In 1926 Polish-born composer Simon Laks (also spelled Szymon, 1901-1983; see 28 February 2017) journeyed to Paris, where he studied music, and became involved in the flourishing classical scene. However, during World War II (1939-1945) with the Nazi occupation of France, he suffered a fate similar to Petr Eben's (1929-2007; see above). Moreover, he was interned in the concentration camp at Auschwitz-Birkenau, Poland, and then with the approach of the Allies in 1945 moved to Dachau. Soon thereafter he was liberated, and returned to Paris, where he'd become a French citizen, and reside for the rest of his life. In retrospect, Laks left a modest body of works that include five string quartets, the first two of which are lost. The surviving three, written during his later years in France, fill out this new DUX release. The third quartet of 1945, subtitled "On Polish Themes", is a medley of same. The opening "Allegro quasi presto" [T-1] is a captivating blend of gay, lively numbers with some striking string effects. While, the next "Poco lento, sotenuto" [T-2] is a restrained offering based on melancholy tunes. Mazurka rhythms dominate the succeeding "Vivace non troppo" [T-3], which is a colorful, pizzicato-riddled creation. Then the final "Allegro moderato, giusto" [T-4] takes us to the Tatra Mountains of southern Poland (see 31 July 2015). Here infectious, foot-stomping ditties with lots of fancy fiddling bring the work to a rousing conclusion. Seventeen years would pass before the appearance of Laks' three-movement, fourth quartet (1962), which is of a completely different character. Moreover, it evokes memories of music heard in Parisian salons, cafes and dance halls during the first half of the twentieth century. The initial "Allegro non troppo" [T-5] has neoclassical overtones reminiscent of early Stravinsky (1882-1971), and is spiced with pizzicato as well as some other unusual string effects. It's based on a jazzy carefree idea [00:00] and a nonchalant countersubject [01:04], which undergo a brisk development [01:38]. They then reappear respectively [03:00 & 03:30] to end this captivating gem like it began. The mood turns wistful in the next "Andante sostenuto" [T-6]. This explores a dark, blues-like melody (DB) [00:42] that alludes to the ill-boding chant known as the Dies Irae (DI) [01:58]. The spirit of the Roaring-Twenties (see 28 February 2012) pervades the jazz-laced "Quasi presto, con fuoco" [T-7]. Here a vivacious introduction is followed by a lively dance tune (LD) [00:21] that turns into a frenetic fugato [01:24]. Then LD returns [02:26], and powers a fiddle-fireworks-filled coda [03:11], ending the work in a shower of sparks. Coming only a year later, the four-movement fifth quartet (1963) is much more progressive. It has stylistic affinities with later twentieth century French music, and brings to mind works by Simon's compatriot and friend Alexandre Tansman (1897-1986, see 30 June 2017), whom he'd known during his early Paris years. The initial sonata form "Allegro moderato" [T-8] inhabits the world of "Les Six", i.e., Auric (1899-1983), Durey (1888-1979), Honegger (1892-1955), Milhaud (1892-1974), Poulenc (1899-1963) and Tailleferre (1892-1983). Its opening statement (OS) starts with a bold, disjointed theme [00:00] succeeded by a mocking variant [00:47]. Then OS is repeated [01:37], and a sinewy development [03:26] follows, after which there's a pert recap [04:53]. The latter ends with a saucy coda [06:48] that concludes the movement hurriedly. A somber "Adagio molto" [T-9] is based on a lachrymose subject [00:00] that engenders a choleric development [01:47]. Then the music regains its composure, and becomes somewhat hopeful [03:22], preparing the way for the third "Scherzo, quasi presto" [T-10]. This is as advertised, and has skittering outer sections based on a fleeting tune [00:00] wrapped around a songlike trio [01:15-02:10]. The final "Allegro giocoso" [T-11] is a rondo, which gets off to a soaring start with an arrestive, recurring subject (AR) [00:00]. AR is interspersed with a couple of eerie transformations [01:01 & 03:13] as well as two animated fugatos [02:01 & 04:04]. Then it makes a final ethereal appearance [04:42], and ends the work suddenly. You may find this movement brings to mind more zealous moments in Shostakovich's (1906-1975) string quartets. Our performing group is the Messages Quartet, which was established in 2014, and named after the great Polish composer Andrzej Panufnik's (1914-1991; see 25 May 2011) Messages Quartet (No. 2, 1980). The four Polish ladies making up this ensemble are all virtuosos, and there's never a lax moment in their dazzling accounts of these Laks' works! Their spot-on intonation, careful phrasing, well-judged dynamics, and rhythmic precision give all three quartets a new lease on life. Made on three occasions during 2015 at the Krzysztof Penderecki European Center for Music located in Luslawice, Poland, the musicians are spread across a wide soundstage in an enriching acoustic. The recordings present an up-front, well-balanced sonic image, which gives an added sense of clarity to these rigorously scored works. More specifically, the string tone is natural with lifelike highs, a pleasing midrange, and clean low cello notes. In short, this DUX release delivers terrific, great sounding accounts of all three extant Laks' quartets on a single disc. Go for it! Born in Friedland, Germany about eighty miles north of Berlin, Emilie Mayer (1812-1883) was one of the nineteenth century's most successful female composers with almost a hundred known works across all genres to her credit. These include eight symphonies and a substantial amount of chamber music. Some of the latter is sampled on this invaluable new release from CPO, namely two of her eight, extant piano trios -- she may have written as many as twelve -- plus a short piece for violin and piano. These are the only recordings of them currently available on disc. Both trios were apparently composed sometime during the late 1850s, and have four movements. The Op. 16 in B minor begins the program, and starts with a sonata form allegro [T-1]. Its opening statement (OS) has an initial, brisk motif (IB) [00:00] that will pervade the movement. IB brings late Beethoven (1770-1827) to mind, and is followed by a winsome, lyrical songlike theme (LS) [01:07] smacking of Schubert (1797-1828). Then OS is repeated [02:24], and succeeded by a captivating development [04:13], spirited recap [05:48], and virtuosic coda [08:17], which ends the movement excitedly. Next, there’s an adagio [T-2] that's a moving introspection, where an attractive rhapsodic idea (AR) slowly coalesces [00:58]. AR is explored, and then dies away, ending this movement with a shade of regret. Then the mood lightens with a perky scherzo [T-3]. Here cocky passages alternate with lyrical ones to the exclusion of the customary central trio section. The finale is another allegro [T-4], but this time it takes the form of a rondo. The recurring subject is a twitchy tune (TT) [00:00] with a rhythmic itch reminiscent of the four-note fate motif in Beethoven's fifth symphony (Op. 67, 1807). TT scurries about donning different guises, and brings the trio to a forceful conclusion. Then we get a heartfelt Notturno (Op. 48, 1883) [T-5] for violin and piano, which was apparently Emelie's swan song. It's a more harmonically progressive, late romantic work based on an initial chorale-like tune first heard on the piano [00:00]. This is picked up by the violin [00:50], and undergoes a somber chromatic development that ends the piece despairingly. Moving along, we come to the earlier Op. 13 Trio in D Major, that's stylistically out of Haydn (1732-1809) and Mozart (1756-1791). The opening sonata form andante [T-6] has a troubled introduction based on a confidant, hymnlike theme (CH) played by the piano [00:00]. This is succeeded by an opening episode (OE) that begins with a perky ditty [01:19] followed by a cheerful variant of CH [01:48]. These are explored, OE is repeated [03:28], and a development follows [05:34] with a subsequent recap-coda [07:19]. the latter concludes the movement joyfully with virtuosic flourishes. The larghetto [T-7] is a dark contemplation of a comely CH-related idea intoned by the piano [00:00]. There are hopeful violin embellishments, but the music comes to a weeping conclusion. Then Emilie lifts our spirits with a through-composed, scurrying scherzo [T-8], which like Op. 16 forgoes a formal trio section. A final presto [T-9] closes the work in rondo fashion. This is based on a fickle, prickly thematic nexus (PF) [00:00] that comes and goes in a variety of catchy shapes and sizes. PF then powers a last-minute coda [07:25] that ends the trio with an ecstatic flourish. Established in 1992, and presumably based in Germany, the Trio Vivente gives enthusiastic yet sensitive accounts of Mayer's music. Some may find Anna Katherina Schreiber's violin tone a bit wiry. However, any shortcomings there are well offset by terrific performances from pianist Jutta Ernst, and consistently solid cello work on the part of Kristin von der Goltz. Another coproduction with Südwestrundfunk (SWR, "Southwest Broadcasting"), Germany (see Fuchs above), the recordings were made in 2015 at SWR's chamber music studio, Stuttgart. They present a wide soundstage with the instruments well placed and balanced across it. While the violin sound is as noted above, the piano comes across magnificently. That also holds for the cello, where there's no hint of boominess in its lower registers. Everything considered, the disc falls just a frog's hair short of demonstration grade. Between them, Austrian composers Julius Zellner (1832-1900) and Richard von Perger (1854-1911) left a substantial body of works across all genres, which include a significant number of chamber pieces. In that regard, each of their undeservedly neglected string trios make their first appearance on CLOFO with this new Centaur release. Johannes Brahms (1833-1897) had a high regard for both, and while they show his influence, each has something new to say. These are the only recordings of them currently available on disc. The program begins with Zellner's, which is in C minor, and dates from 1881. The first of its four movements is a textbook, sonata form Allegro con brio [T-1]. Its opening statement (OS) features a confident theme [00:00] and a related, retiring countersubject [00:50]. Both are reminiscent of Robert Fuchs (1847-1927; see above), who also admired Julius' works. OS is repeated [02:00], and we get an accomplished development [03:54] with a dramatic recap [05:32]. Then a high-strung coda [07:46] brings the movement to a harried conclusion. The Brahmsian, serenade-like "Larghetto" [T-2] has a couple of songful melodies that are respectively hesitant [00:00] and consoling [00:44]. These become the subjects of a conversational episode [03:04] that closes the movement gracefully. A perky "Scherzo: Allegro moderato" [T-3] is next, and has outer sections with a skittish theme [00:00] wrapped around a catchy, ländler trio [01:26-03:06]. It sets the tone for the sonata-rondo "Finale: Allegro molto" [T-4]. This begins with an angular, declaratory idea (AD) [00:00], succeeded by a supple, submissive one [00:51], both of which may bring Julius' German contemporary, Felix Draeseke (1835-1913; see 30 April 2016) to mind. An agitated exploration follows, where AD frequently recurs, and becomes the subject of a waggish coda [05:33] that ends the work definitively. Also in four movements, Perger's D minor Trio (published 1888) is a more harmonically adventurous work. In that regard, the opening "Allegro moderato" [T-5] is a chromatic offering of late romantic persuasion headed towards Zemlinsky (1871-1942) and Richard Strauss (1864-1949). Here a lilting introduction is followed by a yearning, sinuous theme (YS) [00:13], which fuels a through-composed, captivating fantasy that closes the movement tranquilly. The next "Presto" [T-6] is a scherzo with pixilated outer sections surrounding a trio episode [01:13-03:13] based on a related furtive tune. On the other hand, the "largo" [T-7] is a meditation on a melancholy melody (MM) [00:00] that owes a debt to Brahms' late chamber music. The foregoing is offset by an enthralling final "Allegro vivace" [T-8], which is a rondo with a scrappy, recurring subject (SR) [00:06]. SR is interspersed with allusions to past ideas, including YS [beginning at 00:54], and MM [beginning at 01:31]. Then an increasingly frantic, SR-related coda [05:51], brings the trio to a frenzied, virtuosic conclusion. Like the Laks release above, this one features another all ladies ensemble, who call themselves the Concordia String Trio (CST). Formed in 1999, the CST is named after Concordia University, Seward, Nebraska, and delivers magnificent accounts of both scores. Apparently noted for their innovative programming, let's hope these talented musicians soon give us more string rarities! Made last year at the Kimball Recital Hall, Lincoln, Nebraska, the recordings project a generous sonic image in an enriching acoustic. However, some may find the sound skewed somewhat left, and want to tweak their equalizer/tone controls accordingly. As for the string tone, all three instruments are generally well captured. However, there is a hint of edginess in upper violin passages, which seems electronic rather than artist related. With music this engaging, romantic chamber music fans will definitely want this CD, and any audiophiles among them will soon forget its sonic shortcomings.